The increased costs of college tuition and living expenses has led to the unprecedented student loan crisis in America, and with it many questioning whether attending college is still worth the steep cost. As student loan balances increase steadily each year, it is easy to wonder whether the deferred financial benefits of a college degree still outweigh the early financial payoff that comes from quick entry into the labor force without the accompanying college debt. However, according to the numbers from the Department of Labor, the gap of income between the high school educated versus those with a four-year degree continues to make the case for college. Looking at educational attainment, statistics show that the income gap between full-time workers age 25 and over without a high school diploma compared to those with a high school diploma, although significant, are weak in comparison to the gap between those with a high school diploma compared and those with a college degree. Consider the median weekly earnings of $512 for a full-time worker who isn’t a high school graduate. This is nearly $200 less each week than those with high school degrees earning $702. This adds up to a shortfall of $760 a month comparing those who didn’t graduate from high school versus workers with a high school diploma. However, an even greater contrast exists between the average earnings of those with a high school degree (without college) at $702 compared with those holding at least a bachelor’s degree, earning $1,280 per week. This equates to a difference in pay of $2,312 a month which translates to an astonishing $30,056 a year. Those with advanced degrees, professional or master’s degree and beyond, can expect to see even greater earnings with the highest earning 10 percent of male workers making $3,871 or more per week, while the highest earning female worker makes $2,653 or more each week. The pay difference between high school graduates without college versus those with advanced degrees is staggering. You can calculate your hourly wage to yearly salary with this monthly gross income calculator. There is certainly more to the story than comparing those who are college educated versus those who are not. For example, there is also a large salary difference depending on what occupation is pursued (college degree or otherwise). According to the report, among the major occupational groups those in the service industry earned the least amount of money, $497 for women, and $624 for men. Compare this to the median weekly earnings for those employed full-time in professional, management and other related field earning $1,044 for women and $1,436 for men. Still with the stark difference in pay between college graduates and those who never attended college, there remains the question of how debt and lost wages during the years of academic pursuit affect the overall comparison. 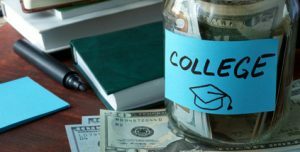 Certainly, there must be a period of catch up for those pursing education rather than drawing a paycheck, and taking out student loans during the process. According to the College Board, by the age of 34, most graduates will have recouped these costs. This assumes graduation within four years, an interest rate of 4.3% on student loan, and the debt paid off within ten years, so, individual circumstance will vary. If you wonder how long will it take to pay off student loans, you can use our student loan repayment calculator which lets you gauge the feasibility of your loan payment with your anticipated future income. There is no doubt that college is expensive, however, unless you are in the minority, a college degree is still the safest bet to obtain the greatest earning potential. With that said, choice of occupation and student debt still will have a large impact on financial stability. What is your opinion? Is college worth the cost?